The age of connectivity is here. With the Internet of Things and clickstream data, it is becoming easier and easier to find out not just who but also what kind of person your customer is. And, if you can use this to provide a better, more wholesome and more convenient experience to your customer – whyever not! Personalisation is not just one or two extra steps – it has unlimited potential. It can help you connect with your customer at a more fundamental level than just a service provider in exchange for a transaction. A simple friendly text message, personalised packaging, a thank-you-note (the favourite of crowd funders) – can go a long way. At the same time, there is a balance to be maintained. 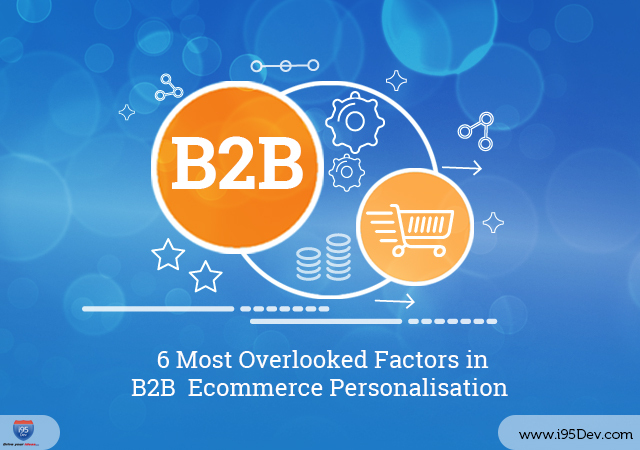 Personalisation in B2B e-commerce may require data, analytics, server time and resources – it can also sometimes go wrong, and become annoying or spammy. The critical question is – what’s the sweet spot when it comes to a personalised e-commerce experience? While exceedingly common for most B2C businesses, mobile compatibility/ support is usually recommended for large distributors. In such cases, a mobile app or mobile-optimized browser experience can create the ease-of-use and portability of functionality that can give even smaller businesses a huge edge over the competition. B2B businesses often dismiss the expense of developing a good mobile experience as unjustified in the face of a relatively small and loyal base of customers. However, this goes a long way in improving your customer’s experience, getting valuable feedback, collecting user profiling data and offering personalized shopping experiences. It is commonly seen that B2C retailers excel at using dynamic and personalized content to send out effective and directed marketing messages. For a long time, this was thought infeasible for B2B retailers to implement. Technology, of course has changed everything, and a whole host of personalise-able experiences are currently on offer to B2B clients. Customized landing pages, personalised product recommendations, the concept of wish-listing, personalized offers and discounts, and more give B2B brands a stage for forming more personal relationships with their clientele. It is common for most B2C businesses to use social media integration to drive customer engagement, but it is sometimes touted as more professional for B2Bs to avoid social media platforms. While most B2B business purchase decisions are process-driven the people involved are still individuals who are very active on social media. Profiling them through social media platforms can help B2B businesses extract a lot of information about them and help them build a better pitch to improve their chances of conversions. In the same vein, considering the amount of data these platforms have, they can also be leveraged to identify a very focused target segment and run a customized marketing and promotion campaign for them. On-field sales representatives are very critical for any B2B business and they have a huge impact on company’s revenue. While businesses relying on sales representatives understand this, they fail to see how they can dramatically improve this by leveraging the strong synergy between on-field sales interactions and e-commerce. On-field sales representative usually rely on memory or outdated data to drive conversations with customers. Imagine the impact they can have with right tools in hand to access the information in the e-commerce store. They can greatly personalize their pitch and offer to customers leveraging that information, negotiate better deals and so much more. The technology has evolved so much that you can stay connected with your customers even when they are not on your website. Armed with customer browsing and/or purchase history, product information, and functionality like remarketing from platforms like Google Adsense, you can create ads personalized to the user and follow them across the internet. While remarketing helps you get in front of customers, the personalization makes it effective and noticeable. This works wonders in increasing visibility and even improving conversions. Do not limit your personalization efforts only to your ecommerce channel. Your customers are present across multiple social media platforms and if you could personalize your messages across these platforms, you have earned customers loyalty for the lifetime. Each platform offers its own advantages and gives you plenty of opportunities to drive engagement with customers. Twitter makes it easy to create personal dialogues and address complaints; hashtags are absolute gold for product discussions, topical Pinterest boards often grow into reliable and loyal customer bases, etc. We hope you enjoyed this list of useful ways to create a brand image and personalised experience for your e-commerce platform. The key takeaway is to keep things personal, and simple! Good luck! B2B ecommerce, e commerce, ecommer, Personalization.